A European summit on the global financial crisis opened Saturday with Britain's leader saying strong banks should be protected and "whatever is necessary" must be done to restore stability. Prime Minister Gordon Brown called on his European counterparts at the hastily arranged meeting in Paris to send the message that "no sound, solvent bank should be allowed to fail through lack of liquidity." "We must take the action necessary to sort out whatever failings exist in the system," Brown said, with summit host French President Nicolas Sarkozy standing at his side. "People will be very clear that every country represented here today will want to do whatever is necessary to secure the stability of the system and to ensure the safety of hardworking families and businesses in each of our countries," Brown said. But European governments differ on how far they should intervene. France had mooted - but backed off - a multibillion-euro EU-wide government bailout plan; Germany says banks must find their own way out of the turmoil; Britain is suggesting a new fund to boost small businesses likely to be hard hit. The talks, also attended by German Chancellor Angela Merkel and Italian Premier Silvio Berlusconi, were being held amid signs that the financial crisis that devastated Wall Street is spilling into the real economy and amplifying a slowdown across Europe. More worrying is that Europe hasn't pulled together on dealing with the crisis this week. Both Ireland and Greece acted independently, angering EU neighbors by offering their banks government guarantees to protect all savings. That goes far beyond the standard EU guarantee for the first €20,000 ($27,668) in a bank account - and could see worried savers elsewhere in Europe move money where they believe it will be safe. Britain and others complain that the plan may break EU fair competition rules. Merkel downplayed divisions at the summit, saying there is "a high degree of common ground" between Europe's four largest economies that they must prevent a repeat of such crises. Merkel said politicians must step in to find solutions, but also warned that "those who caused the damage must of course also make their contribution." Sarkozy said he agreed, and added that the crisis is a global problem that needs a global response. "Europe must show its desire to present a solution. That will reassure everyone," he said. On Friday, U.S. Congress approved a $700 billion government plan to buy up bad debt from banks and help unfreeze lending, which U.S. President George W. Bush quickly signed into law. The head of the International Monetary Fund, who met with Sarkozy before the summit, said the crisis represented a "trial by fire" for the euro, Europe's 10-year-old common currency - and would require a quick, coordinated response. "We have to make sure Europe takes its responsibilities like the United States," said Dominique Strauss-Kahn. Banking shares have plunged in Europe amid fears that banks would be unable to find credit to cover their debts. Several European governments have stepped in to save major banks, including Britain's Bradford & Bingley, Belgian-Dutch Fortis, Belgium's Dexia and Germany's Hypo Real Estate. The EU leaders were joined in their talks by European Commission President Jose Manuel Barroso, European Central Bank President Jean-Claude Trichet and top economic official Jean-Claude Juncker. A senior Sarkozy aide sought to dampen expectations, saying the European leaders are not "going to save the world." They will set out what Europe wants the rest of the world to do to shore up the banking system, before next week's Group of Eight meeting on the economy involving four EU nations, the United States, Japan, Russia and Canada. Britain's Brown said he wanted Saturday's discussions to focus more on the wider economy, seeking support for a £12 billion ($21 billion; €15.18 billion) fund to help small businesses survive. Britain, like France, is forecast to slip into recession this year. The French, through Finance Minister Christine Lagarde, proposed creating an emergency EU fund for struggling banks. 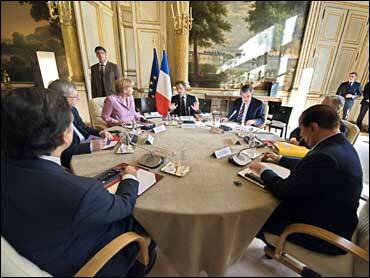 But Sarkozy quickly distanced France from the idea after it was swiftly rejected by Germany. German Economy Minister Michael Glos told Bild am Sonntag newspaper that any emergency bailout would distract from efforts banks should be making themselves to restore confidence. "Banks don't trust each other anymore. That's the core of the financial market crisis," he said. "In this situation, I don't think it's defensible to demand the state restore the trust that has been gambled away with large-scale debt write-offs using tax money." The head of French bank Societe Generale insisted action to shore up confidence and liquidity was vital. "We are in the eye of the storm," Frederic Oudea told Le Parisien newspaper. "Intervention from states and central banks is essential to avoid a domino effect."